Note: If you decide to purchase something via a link in this post, I may make a profit. I only recommend things I use and love! You need content to post! In my example, I used the Holiday Graphics Pack of 25 images. Facebook posts, ready to edit and schedule. If you need to locate or create content, you’ll need to make time for that. If you buy a graphics pack, you can unzip the file and be good to go. I decided to brand the 25 graphics from the package so I could tell you how long that takes. Adjusted for Hue (Command-U), making most purplish (my brand color). Typed in a watermark and adjusted its color. Saved each using “Save for Web” maximum resolution JPG. Time: 40 minutes to edit and add a watermark to 25 images. You can add your logo or URL in any graphics editor, if you don’t use Photoshop. Could be Canva, PicMonkey, or a watermarking tool. Faster: post them as-is. 5 minutes to purchase, download, and unzip. Logged in as an admin, go to your Facebook Page. 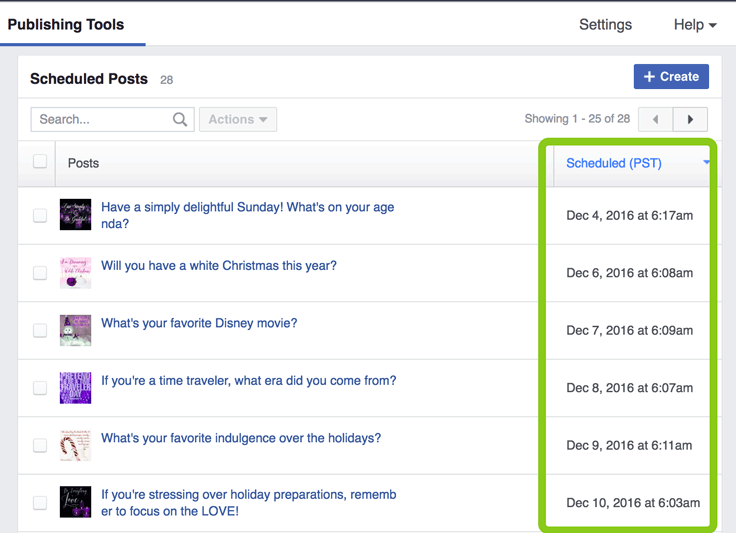 You can schedule posts right in the Status Update box at the top of your Page, or go to Publishing Tools –> Scheduled Posts –> + Create. The only difference is the text on the blue button vs. the drop-down arrow. The only difference in scheduling Facebook posts on the Page or in the Publishing Tools is the text on the blue button vs. the drop-down arrow. When scheduling images, I find it easiest to start with the image, then add the words. Click the Photo / Video button and upload that first. Type in your text. Keep it short, and use a question to engage your audience. Find the schedule button and pick a time. Choose an odd time, like 6:17 or 9:53. Rinse and repeat! When you have all your posts scheduled, glance over the list under Publishing Tools –> Scheduled Posts to ensure you didn’t make any errors. Time: 30 minutes for 25 posts. Five to seven posts a week is a good posting frequency for most pages. So you may want to schedule 21 to 31 posts for any given month. Your time may vary, but if you have pre-made graphics, and get into a rhythm with your text, it saves so much time over posting them one-by-one. Imagine stopping what you’re doing, finding what you want to post, and coming up with something to say. That’s surely at least 10 minutes each time you post. To find engaging content that you can edit and schedule in minutes, try PromoRepublic. To find viral content that you can share, try Post Planner. To schedule your blog content on autopilot, try Missinglettr (or read my review here). Try it out! 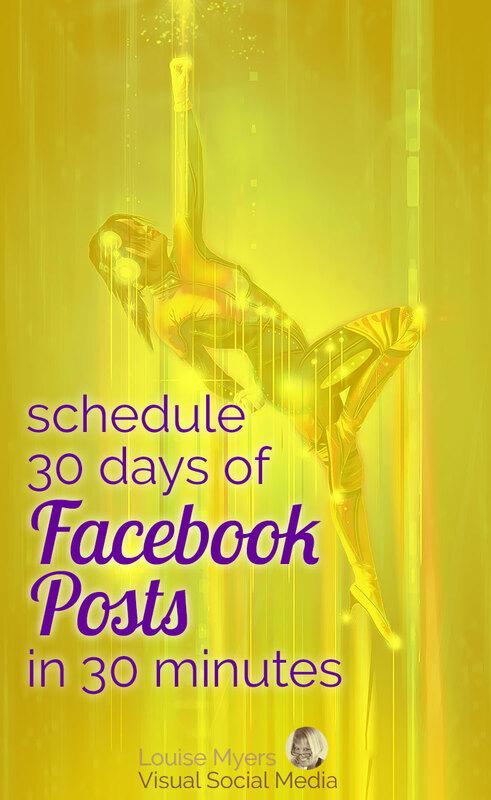 I’d love to hear what you think about this method to schedule Facebook posts. You did allude to it briefly by mentioning the “batch watermarking” but I wanted to point out that in the interests of saving time, you can also run this entire process as a batch job right in Photoshop. Doing 25 images would take 60 seconds or less. Oh yes, thanks for pointing that out, Sal! Thanks once again Louise. 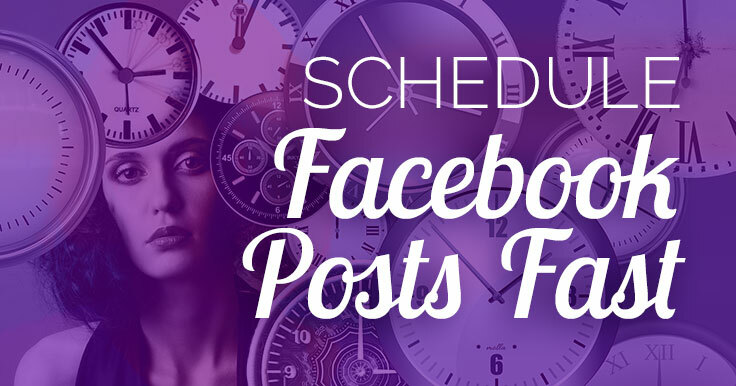 I do schedule posts on facebook once in a month for my business website using the scheduling tool but usually spend as much as two hours because I repost old posts and schedule for the next 30 days. After this I spend less than an hour daily engaging my fans and replying questions and/or comments. I’ll try out this method of yours – seems easy and it’ll save me some graphic design costs. Finding content (even from your own page or hard drive) can be time consuming. If you had success with certain posts though, it’s always a good idea to reuse them. Many thanks for the post on scheduling posts on FB. I haven’t done watermarking let alone batch watermarking before. Can you point me to where I can learn to do this? 1. Plan image themes in proper manner. 2. Use hash tags only 3 including keywords. 3. Also in the text section use link of your business website. 4. Text also include informative heading which helps to reach out to visitors. Great information, I added some more additional advantages with it. Great information and ideas. Love your posts and “extras”. Always helpful and easy to put to use right away. With a nod to Australia, we too in South Texas, USA, never have a white Christmas. So, I am always seeking Christmas themed graphics without snow to best reflect our part of the world. I haven’t seen real snow in 2 decades! 🙂 I still feel “White Christmas” is some sort of Christmas ideal. But I agree that incorporating a “Texan” flavor would make your Christmas graphics more unique. I just sat down and filled my Buffer queue for two accounts with these images, then I ran across your post. It’s nice to get a confirmation I’m on the right track! Scheduling content isn’t a challenge…coming up with unique ideas for content is. In particular I have a client which is a marketing arm for the vinyl industry. (vinyl windows, doors, floors, medical equipment, underground pipes, etc)…Creating and finding relevant content on this subject matter is extremely difficult…any recommendations? I don’t have anything specific to that industry, but the bottom line as far as the educational content you post is, What would help my future customers make a decision on this topic? Helpful advice, not biased to your client specifically, but showing they know the business in and out. 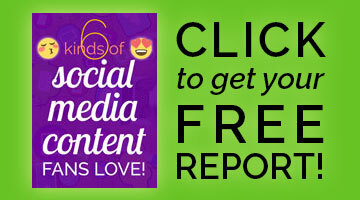 As far as other, more entertaining content to post, check out my Social Media Content Planner! Chock full of ideas for fun and shareable posts. Oh yes! 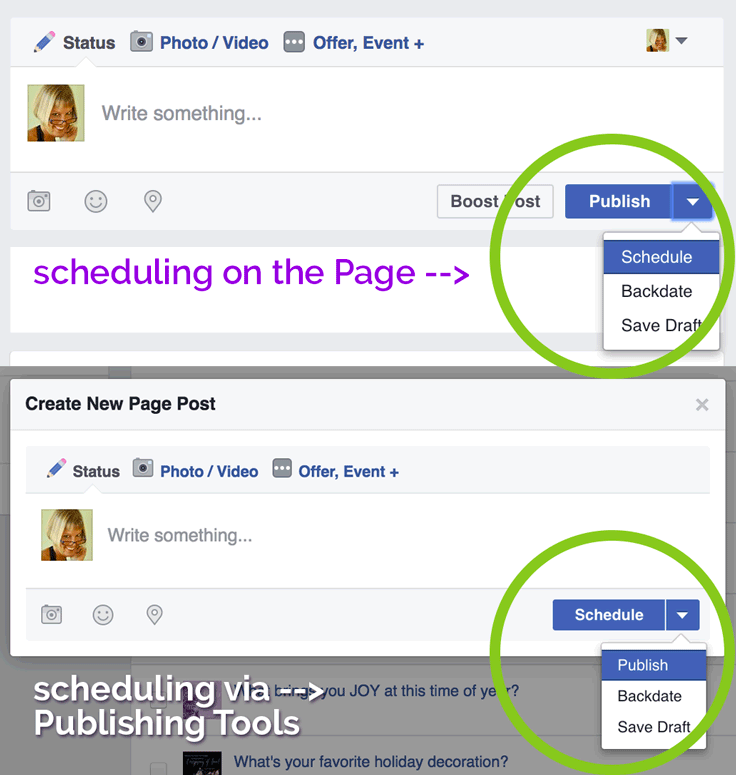 I will clarify, you can only schedule FB posts inside FB on a business page. For groups or personal, you will need a paid tool. Thanks for pointing this out. Thanks for sharing such an easy way to schedule posts.. I have been scheduling posts for months with no problem. All of a sudden in the past couple of weeks, my schedule posts don’t show up and disappear from my scheduled posts section as well as my drafts. I have contacted Facebook and they have asked me to clear my cache and try again. This works for a few days, but I am noticing that I am needing to clear my cache every few days. Have you had this happen or heard of anyone else having this issue? I haven’t heard of this particular issue, but I do have other problems with caching. I’m not sure why!